“The Outdoor Sporting Library is a site dedicated to providing information on books and other media focused on hunting, fishing, and related outdoor pursuits. A wealth of literature exists in the hunting and fishing world, including fiction and nonfiction books, short stories, and essays relating to the sport. Unfortunately, much of the outdoor sporting works of the past have been left there, and are little known today. The works of writers who were giants of their day, including the likes of Edmund Ware Smith and Arthur MacDougall, sit in dust-covered library shelves and old book stores, waiting to be re-discovered by a new generation of outdoor readers. What a great idea! My only problem is that I didn’t think of it! In all seriousness, I totally agree that there exists a real need for information on the outdoor sporting classics and fully support Jeremiah’s efforts. It is good to see someone step up and take the helm of that great ship of literature. I hope you will support this blog and rediscover the classics. 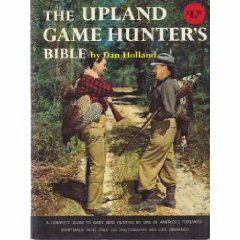 Dan Holland’s, The Upland Game Hunter’s Bible. Speaking of classics, when Jeremiah contacted me last week requesting to repost my review of Dan Holland’s, The Upland Game Hunter’s Bible (which was originally posted on Upland Equations and can still be found in the archives), I was both honored and happy to contribute to The Outdoor Sporting Library. For those interested in reading this review, here’s the link: http://www.outdoorsportinglibrary.com/.